This Austrian late Art Nouveau period advertisement for Mem's features a bold yellow-gold background with large, deep purple lettering for the brand name. The plum color is used again in the detail of the various products being advertised. 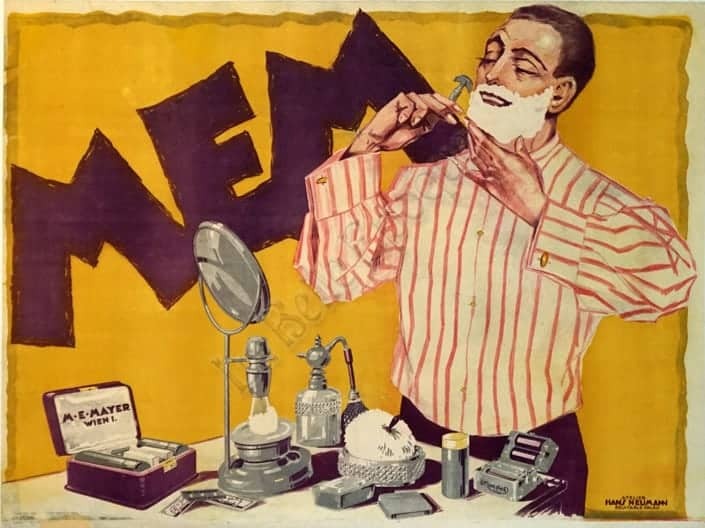 A man, shaving, and his various supplies pop out and capture the foreground of this poster. This original vintage poster is a stunning example of clean, bold lines and color, perfectly paired with a hint of natural detail. This late Art Nouveau early Art Deco Austrian poster is for MEM's: men's shaving cream. The artist and printer was Hans Neumann, a prolific Austrian lithographer, as well as a screenwriter, film director, and producer. While living in Vienna he created his own advertising studio, which quickly became a successful agency. He designed many posters for festivities, exhibitions, dances, performances, films, and fairs. This original poster was printed by Hans Neumann in 1920.